Todd Rundquist, owner of West Winds Earthscaping, dives into the concept of natural swimming ponds. First introduced in Austria in 1983, natural swimming ponds have grown in popularity over the past couple of decades. Now taking off in the U.S., these cool pools are safe and sustainable using no chemicals. SLHL: What is a natural swimming pond? Todd: A natural swimming pond (NSP) is a body of water created to combine the beauty of nature with the benefits of a refreshing swim in the heat of summer. The size and shape are as vast as the variety of plants that can be grown in the water. The water is cleaned and purified by the combination of plants and microorganisms. 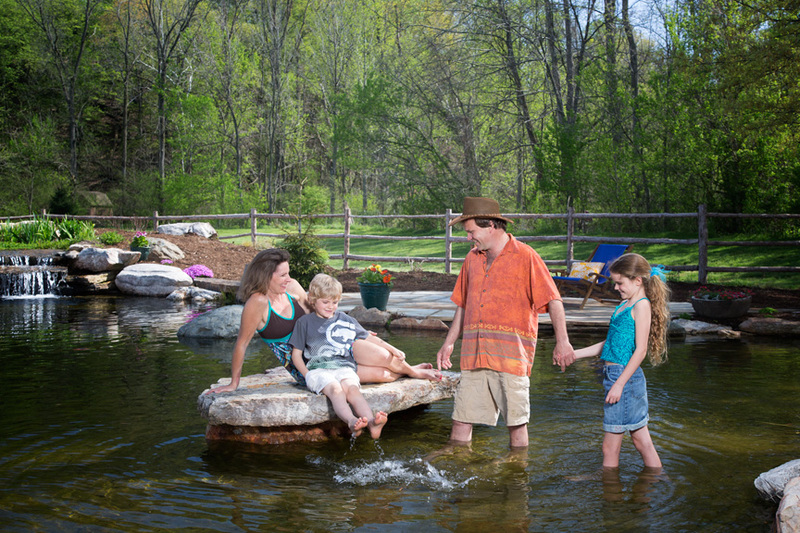 SLHL: How is a natural swimming pond constructed? Todd: Natural swimming ponds can be constructed as a conventional pool or more like a natural pond using a rubber liner and large boulders. It seems to me there are no hard lines in nature, and large boulders lend themselves well to the construction of a NSP. NSPs are separated into two zones… the regeneration zone and the swimming zone. The regeneration zone is the area of the pond where plants are growing, consuming nutrients and impurities from the water. When healthy populations of plants are growing, they consume the available nitrogen necessary for algae growth and this starves out the algae. Typically the swimming zone is separate from the regeneration zone. However, strategically placing specific plant varieties in the swimming area can easily merge with the regeneration zone, creating a more “one with nature” experience. SLHL: Why is the water safe for swimming? Todd: The water is safe for swimming because it is filtered through the roots of plants where nutrients are absorbed and converted into biomass. An established pond develops a patina, which is a colony of invertebrates and microorganisms that consume harmful bacteria. An ultra-violet sterilizer can also be used to eradicate free-floating, harmful bacteria. In addition to plant roots and the patina, beneficial bacteria are colonized in the planting areas as well as in a large bio filter. The beneficial bacteria are highly effective in water purification. SLHL: What types of plants are best for an NSP? Todd: There are three types of plants used: submerged (oxygenators), floating land plants (lilies) and marginal plants. Each type of plant has many varieties and all serve important functions in filtration. SLHL: How are NSPs eco-friendly? Todd: Natural swimming ponds are very eco-friendly. Water is a key ingredient to life. There is nothing like pure, chemical-free water to encourage a wide diversity of life. The larger the plant variety the larger the bio-diversity it will bring. SLHL: Can a traditional pool be converted to a NSP? Todd: We have converted two conventional gunnite pools to NSPs by introducing a large regeneration zone full of plants and gravel. The water is pulled from the pond and pushed up through the gravel and the roots, then flows back to the pool through a stream and waterfall. Both of the projects have introduced Koi fish and enjoy clear, chemical-free water.